For the second Carloman of the Carolingian dynasty, sometimes called "Carloman II", see Carloman I.
Carloman II (c. 866 – 6 December 884) was the King of West Francia from 879 until his death. A member of the Carolingian dynasty, he and his elder brother, Louis III, divided the kingdom between themselves and ruled jointly until the latter's death in 882. Thereafter Carloman ruled alone until his own death. He was the second son of King Louis the Stammerer and Queen Ansgarde. Upon Louis the Stammerer's death, some Frankish nobles advocated electing Louis III as the sole king, but eventually both brothers were elected kings. 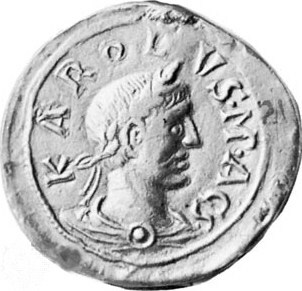 Carloman was crowned in September 879 at Ferrières-en-Gâtinais. Although some doubts were cast upon the legitimacy of their birth, the brothers obtained recognition and in March 880 divided their father's realm at Amiens, Carloman receiving southern Kingdom of Burgundy and Kingdom of Aquitaine. Wikimedia Commons has media related to Carloman II of France. This article incorporates text from a publication now in the public domain: Chisholm, Hugh, ed. (1911). "Carloman (Frankish princes)" . Encyclopædia Britannica (11th ed.). Cambridge University Press. 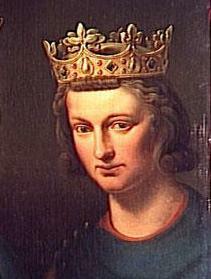 Louis III was the king of West Francia from 879 until his death in 882. The eldest son of king Louis the Stammerer and his first wife Ansgarde of Burgundy, he succeeded his father and ruled jointly with his younger brother Carloman II, who became sole ruler after Louis's death. Louis's short reign was marked by military success. Charles III, also known as Charles the Fat, was the Carolingian Emperor from 881 to 888. The youngest son of Louis the German and Hemma, Charles was a great-grandson of Charlemagne. He was the second-to-last emperor of the Carolingian dynasty and the last to rule, briefly, over a re-united Frankish empire. Richard, Duke of Burgundy (858–921), also known as Richard of Autun or Richard the Justiciar, was Count of Autun from 880 and the first Margrave and Duke of Burgundy. He eventually attained suzerainty over all the counties of Burgundy save Mâcon and by 890 he was referred to as dux (duke) and by 900 as marchio (margrave). By 918 he was being called dux Burgundionem or dux Burgundiae, which probably signified less the existence of a unified Burgundian dukedom than feudal suzerainty over a multiplicity of counties in a specific region. Boso was a Frankish nobleman of the Bosonid family who was related to the Carolingian dynasty and who rose to become King of Lower Burgundy and Provence. Middle Francia was a short-lived Frankish kingdom which was created in 843 by the Treaty of Verdun after an intermittent civil war between the grandsons of Charlemagne resulted in division of the united empire. Middle Francia was allocated to emperor Lothair I, the eldest son and successor of emperor Louis the Pious. His realm contained the imperial cities of Aachen, the residence of Charlemagne, as well as Pavia but lacked any geographic or ethnic cohesion which prevented it from surviving and forming a nucleus of a larger state, as was the case with West Francia and East Francia. Richilde of the Ardennes was the second consort of Charles the Bald, King and Emperor of the Franks. By her marriage, she became Queen of the West Franks, and then Empress of the Franks. She also served as a regent. Louis the Younger, sometimes Louis III, was the second eldest of the three sons of Louis II the German and Emma. He succeeded his father as the King of Saxony on 28 August 876 and his elder brother Carloman as King of Bavaria from 880 to 882. He died in 882 and was succeeded in all his territories, which encompassed most of East Francia, by his younger brother, Charles the Fat, already King of Italy and Emperor. Louis the Stammerer was the King of Aquitaine and later the King of West Francia. He was the eldest son of emperor Charles the Bald and Ermentrude of Orléans. Louis the Stammerer was physically weak and outlived his father by only two years. The Treaty of Ribemont in 880 was the last treaty on the partitions of the Frankish Empire. It was signed by the German king Louis the Younger and the kings of Western Francia, Louis III and Carloman.